In the ongoing effort to prevent drunk driving, the federal government has introduced a new cellphone app. Called “SaferRide”, the app was released by the National Highway Transportation Safety Administration (NHTSA), and is now available for download. Unlike the ENDUI app released by the State of Maryland, this app doesn’t try to estimate your BAC level or offer reaction testing games. 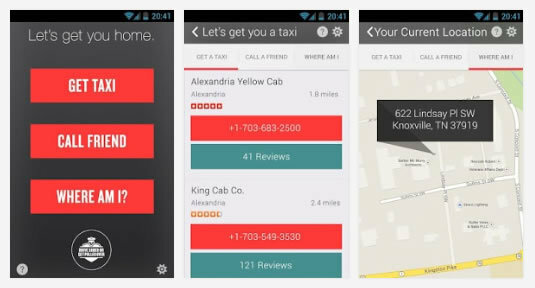 Instead, for anyone who drinks and needs a safe ride home, the app will locate and call a taxi service close to their current location. It can also contain a list of designated driver phone numbers that the user pre-programmed into the app. NHTSA reports that, while traffic deaths due to drunk driving declined by 2.5 percent in 2013, there were still 10,076 people killed by drunk drivers. Deaths due to drunk driving make up approximately one-third of all traffic deaths each year. The annual holiday travel period “Drive Sober or Get Pulled Over” crackdown is now in full force and, unfortunately, many drivers will be facing arrest for DUI over the next couple of weeks. Any tool that can help prevent drunk driving in America and save lives is a welcome addition. The app is available free for download into Android devices on Google Play, and Apple devices on the iTunes store.